Beautiful compact pocket sprung daisy leather chaise corner. 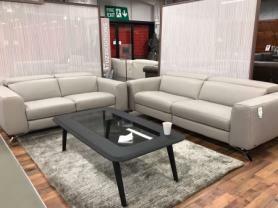 Ideal for compact place , slim design with off the floor feet compliment the look of the sofa. Leather is lovely soft and thick , family friendly as it has a protection on top. Approximate Measurements: L: 229 cm. Chaise: 160 cm. Depth: 96 cm.